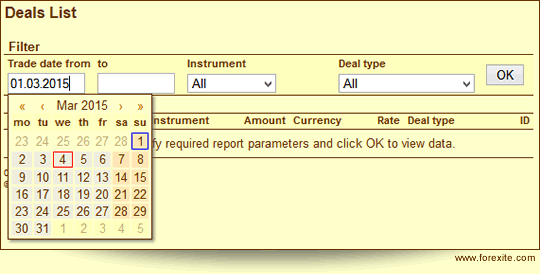 There is a filter in every report which allows for selecting the information by date, currency or instrument, deal type, or document status. The dates for a report can be set either manually or can be chosen from the calendar. We do not recommend setting a too wide range of dates, as the report download can be lengthy in this case. Let’s have a detailed look at the reports. 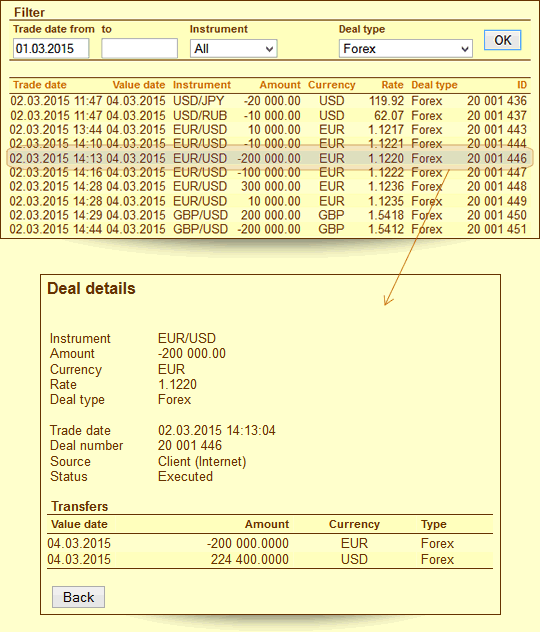 The report "Deals List" is meant to trace the trades on your trading account. You should specify the period, the instrument and the trade type in the filter. The report "Orders List" allows for tracing the orders. By default, the report includes all the orders which have been modified (edited, executed, cancelled, or activated) within the selected period of time. The report - as is the case with the "Deals List" report - states only the most important data on the orders. The more detailed information can be called by clicking on the order. The "Account Summary" report provides you with the most important data about your account: the account state, open positions on Forex trades, active orders, and currencies balances. All amounts are rounded to whole numbers for easy read. If you need to quickly get a more detailed information, you can do this as follows. Note the table headings in the report are the active links. So, if you click on the title, the corresponding page of TradeRoom opens. For example, if you need more information about the open positions, click on the heading "Open positions (Forex deals)" to get to the "Open Positions" tab of the "Trading" page. The profit (or loss) gained in different currencies, are automatically converted by the system into USD at the current rates. That’s why the reported profit (or loss) change as the market rate changes. In computing the profit (or loss) all deals are taken into account, except the account funding and funds transfer transactions.